Line engraving, based on a sketch by Alexander Simplot, published in "Harper's Weekly", 1862, depicting ships sunk by the Confederates off their fortifications at Island Number 10, circa 7 April 1862. As identified on the engraving, the ships are (from left to right): Champion, Yazoo, Grampus, John Simonds, Red Rover, Prince, Admiral, Ohio Belle, De Soto, Kanawha Valley, Winchester and Mars. Most of these vessels, some of which were not sunk, were later employed by the Union forces. THREE YEARS IN THE CONFEDERATE SERVICE: CHAPTER II. Reelfoot Lake is a shallow natural lake located in the northwest portion of U.S. state of Tennessee, in Lake and Obion counties. Much of it is really more of a swamp, with bayou-like ditches (some natural, some man-made) connecting more open bodies of water called basins, the largest of which is called Blue Basin. Reelfoot Lake is noted for its bald cypress trees and its nesting pairs of bald eagles. Island No. 10 is, or was, in the Mississippi River, opposite the boundary line between Kentucky and Tennessee. The river approaches the island in nearly a southerly direction, then runs to the northwest about twelve miles to New Madrid, where it makes a semicircular sweep, and takes its course to the southeast for sixteen miles to Tiptonville, Tenn., forming a great horseshoe bend of six miles in width, and opening to the southeast. 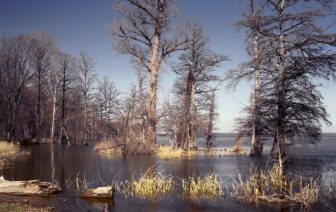 Across this opening, a few miles to the eastward, is Reelfoot River or bayou,emptying into the Mississippi below Tiptonville; in high water expanding into a lake, and connecting with the Mississippi above Island No. 10, cutting off all approach except by boats. 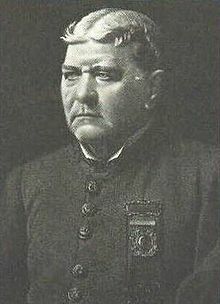 McCown was promoted to Major General on March 10, 1862, and ordered the evacuation of positions at New Madrid to Island No 10. on the evening of March 13 after several days of siege. 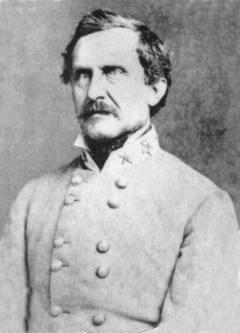 McCown was criticized for abandoning arms and supplies in a hasty withdraw from positions at New Madrid. At the beginning of the bombardment, Gen. McCown was in command of the Confederate forces, augmented, by the evacuation of New Madrid, to some ten or twelve thousand men. More than half these troops were, however, withdrawn about the last of March. The batteries, which had been ably planned, but imperfectly constructed, under direction of Capt. Harris, of the Engineer Corps, contained forty-four guns, mostly 32 and 42 pound smooth-bores, with a few 64-pounders and one or two 100-pound rifles. Twenty-seven guns, not mounted, were scattered along the river bank and on the Island. The batteries were distributed as follows: On the Tennessee bank of the river were six—No. I (Rucker’s), six guns; No. 2, four guns; No. 3, three guns; No. 4, four guns ; No. 5, two guns; No. 6, seven guns ; total, twenty- seven. On the Island were four batteries—No. 1, six guns; No. 2, four guns; No. 3, five guns; No. 4, two guns ; total, seventeen. A floating battery — the old Algiers floating dock—was moored to the left bank of the Island; and on the deck of this nondescript craft, wholly unprotected, were eight guns. The enemy, upon the evacuation of New Madrid, established batteries there and soon after at Point Pleasant, opposite Tiptonville — thus cutting off approach to the island by river. Boats made a landing at Tiptonville and—when it became too warm there—at a point just below, and thus communication was kept up till the gun boats ran the Island 10 batteries, a few days before the surrender. On the morning of March 15th the Federal fleet arrived from above, and opened fire upon the Confederate works. There were seven iron-clads: the “Benton,” “ Louisville,” “ Carondelet, “ Conestoga,” “ Pittsburgh,” “ St. Louis ” and “Mound City,” armed with ten heavy guns each, and eight mortar-boats, each carrying one thirteen-inch mortar. Their fire concentrated on Rucker’s and the Island batteries, was continued all day and slowly on Sunday, the 16th. Monday morning the iron-clads, lashed three together, dropped down the river, stern foremost, to within a mile and a half of Rucker’s Battery and anchored. They maintained a heavy fire all day, throwing, with the mortar fleet, 1,350 shot and shell, of which 1,000 were hurled at Capt. Rucker’s guns and 350 at the Island. On May 10, 1862 Rucker was transferred and promoted to captain of Company C, 1st Tennessee Heavy Artillery, his unit composed primarily of men from Illinois. His company worked three 8-inch Columbiads and three 32-pounders as part of the garrison during the Battle of Island Number Ten. When the island fell he escaped and was commended for his valor. There was no one hurt on the Island, though there were many narrow escapes. At Battery No. I, on the mainland, a shot passed through the parapet, dismounting a gun, killing Lieut. Clark, of Capt. Rucker’s company, and wounding several men. These were the only casualties during the siege. Eicon Jones, of the Signal Corps, was stationed at Rucker’s Battery. During the day his signal-flag was twice shot from his hand. In one instance he was transmitting a message, and he picked up the flag and continued his communication without missing a word. He was afterwards complimented in general orders by Gen. Beauregard and promoted. The Confederate artillery practice was very good; the iron-clads were repeatedly hit, and before night they hauled off, continuing their fire with their long-range rifles. One shot struck the “ Benton,” passed through her iron-clad side into the Captain’s cabin, bounded from the floor to the ceiling and landed on the table. 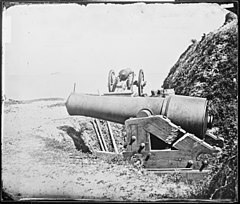 The dismounted gun at Battery 1 was placed in position again that night, not having been seriously damaged. The columbiad was a large-caliber, smoothbore, muzzle-loading cannon able to fire heavy projectiles at both high and low trajectories. This feature enabled the columbiad to fire solid shot or shell to long ranges, making it an excellent seacoast defense weapon for its day. Tuesday the bombardment was resumed, but the fleet did not come within good range of the Confederate smooth-bores, and our fire was, in consequence, slack. Capt. Rucker’s company, exhausted by its severe labors, was relieved by the First Alabama. The river continuing to rise, the working of the guns in Battery No. 1 was rendered difficult, if not impossible, by the water, which was two feet deep on the platforms. All the powder and shell had to be removed from the magazine, and, without other protection than a tarpaulin, stowed in an angle of the breastworks. On rainy days some of the guards would creep under the tarpaulin, propping it up with a handspike so as to get air; but this improvised tent would invariably attract the enemy’s attention, and a shell would go shrieking over, causing the hasty striking of the shelter. A deep slough connecting with Reel- Foot Bayou cut off all approach to this battery except in boats, and as the relief details had to be sent up after dark, a trip on stormy nights was attended with some risk. On one occasion a boat was carried by the swift current into the swamp and capsized; the crew were not rescued till daylight—passing the night, cold and wet, on stumps or driftwood. In the meantime the enemy’s engineers were clearing a channel, or canal, through the swamps and bayous on the west side of the river, from a point above the Island to one below, to enable them to get small transports below the batteries and to transport troops across the river and take the Confederates in the rear. But little digging was required, as the high stage of the river gave the necessary depth of water; but the trees had to be cut out of the way. The trees were felled, leaving the stumps just above the water. A cross-cut saw, forming the lower side of a triangular frame, was then pivoted by the upper angle to the stump, so as to swing freely—the blade of the saw being four feet below the surface of the water. Twenty men on a side operating this simple device could cut off a stump two feet in diameter in a few minutes. The canal was completed early in April, and several transports were at once sent through, arriving safely at New Madrid. Among the equipment for each gun was an iron spike and a hammer. Any crew member could drive the spike into the touch-hole if necessary. The gun was unusable until the touch-hole could be redrilled. As the gunboats were of too deep draught to use the canal, preparations were at once made to run one of them by the batteries, and, as a preliminary step, it was decided to spike the guns in the dangerous upper battery. On the night of April 1st five boats were made ready with crews from the gunboats “ Cincinnati,” “St. Louis,” “Benton,” “Pittsburgh” and “Mound City,”and volunteers from the Forty-Third Illinois Infantry, all under command of Col. Roberts. In each boat were twenty men, exclusive of officers. Every precaution was taken to insure secrecy; the oar-locks were muffled, and the expedition did not start till midnight, when all was quiet. The night was dark and stormy, and the only difficulty was in finding the battery; but a flash of lightning revealed its position as they got abreast, and a landing was effected without opposition. But two sentinels were on the battery; these fired their guns and ran back to the main guard, who were on the parapet of the breastwork in the rear. By the time the alarm was fairly given the enemy had spiked the guns and re-embarked. The successful termination of this attack was due largely to the fact that the battery being submerged except the parapet, there was no place for the guard immediately around the guns, though there was, undoubtedly, carelessness in not having more men on duty. A boat was despatched to camp with the alarm, and a fresh detachment of men was sent up. Co. K, prior to this event, had received no arms, but during the alarm a lot of old muskets and ten rounds of cartridges were distributed. Two of the guns were unspiked during the nights of the 2d and 3d. The night of April 4th set in dark and threatening; in the midst of a terrific thunder-storm the long-roll sounded, and the battalion was hastily formed in line of battle in the rear of the batteries. Mingled with the almost continuous roll of the thunder was the roar of a heavy cannonade, while the lightning and the flashes of the guns, rendered more vivid by the intense darkness of the night, combined to render it a scene of wonderful grandeur. The firing continued but for a brief period, and quiet being restored, the men were dismissed to their quarters. In the morning it was ascertained that the iron-clad “ Carondelet,” protected by barges of baled hay, had successfully run the batteries. She was first discovered by the sentinels at Rucker’s Battery, who fired their muskets, giving the alarm. 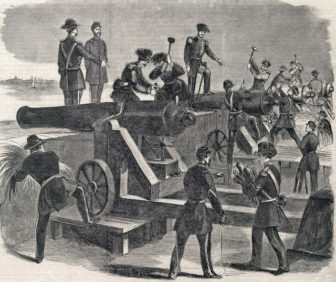 An attempt was made to use the two guns which had been unspiked, but the charges were damp, not having been drawn after the guns were unspiked, and they could not be fired. During the 5th the fleet shelled the camp of the First Alabama and other regiments, but no one was hurt. The following night the enemy crossed a small force opposite New Madrid, and spiked the batteries of light artillery stationed there, but immediately retired. Sunday, the 6th of April, was clear and pleasant, and passed quietly. At dress-parade the troops were ordered to be in readiness to march at the sounding of the long- roll. The signal came while the men were preparing or eating supper, and leaving everything—the tents standing, cooking utensils scattered around, in some cases the food half cooked in the kettles—the battalion of the First Alabama in camp, numbering about 325 men, formed on the parade-ground and marched to the general headquarters. About 350 of the regiment stationed on the Island, 60 at Battery No. 1 and a considerable number sick in camp were left behind. 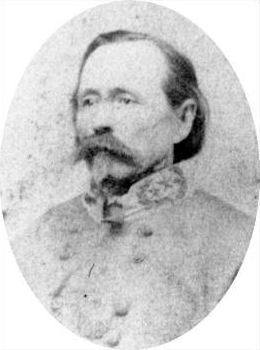 William Whann Mackall was a Seminole Wars veteran, Mexican–American War veteran and Confederate States Army brigadier general during the American Civil War. He was a United States Army officer for 24 years before he resigned his commission in order to join the Confederate Army. The commander of the forces at this time was Gen. Mackall, Gen. McCown having been relieved April 1st. It was dark when the troops, about fifteen hundred in number, left headquarters, the First Alabama in the advance. After marching ten miles, the column was halted in the woods, and formed in line of battle about half a mile from the river and nearly opposite New Madrid. It soon began to rain, and as fires were not permitted, the condition of affairs was anything but pleasant. The object of the move was, ostensibly, to prevent a landing of the enemy, crossing from New Madrid. The night, however, passed without alarm, except a slight stir caused by pickets bringing in a prisoner. A heavy cannonade in the direction of Island No. 10 announced that another iron-clad had stolen by in the darkness. This vessel, it was afterwards learned, was the “ Pittsburgh; ” she was protected in the same way as the “ Carondelet,” and received no injury. Daybreak found the men cold, wet and hungry, many of them having eaten no supper. The wagons arrived about 7 o’clock; flour, bacon and cooking utensils were issued to the companies, and an attempt was made to prepare breakfast; but orders to resume the march compelled the men to leave the half- cooked meal on the coals. Information had been received that the Federal troops were crossing lower down the river, and that the garrison was in danger of being cut off. Many of the troops were unaccustomed to marching, and upon leaving camp had overburdened themselves with baggage. As a consequence, the road along which the men were hurried was strewn with every kind and description of apparel and not a few blankets. It was nearly dark when the command approached Tiptonville, and, making a detour, passed around and below it. That landing was already in possession of the enemy, and a force of their cavalry were following close in the rear of the retreating Confederates, picking up stragglers. While opposite Tiptonville there was an alarm, and the column was halted and brought to a front; but no attack was made, and the march was resumed. About three quarters of a mile below Tiptonville the command was formed in line of battle, and there remained all night, the men sleeping in ranks, with their arms by their sides. Gens. Gantt and Walker, who had been stationed opposite New Madrid, had retired with our command, and the combined force numbered between 2,000 and 3,000 men. Soldiers: —We are strangers—the commander to the commanded, and each to the other. Let me tell you who I am. I am a general made by Beauregard—a general selected by Gens. Beauregard and Bragg for this command when they knew it was in peril. They have known me for twenty years; together we have stood in the fields of Mexico. Give them your confidence! Give it me when I have earned it! Soldiers! the Mississippi Valley is entrusted to your courage, to your discipline, to your patience. Exhibit the vigilance and coolness of last night, and hold it! Gen. Beauregard, in a communication published since the close of the war, expressed himself as satisfied with Gen. Mackall’s performance of the trust, but his troops saw only a series of blunders. 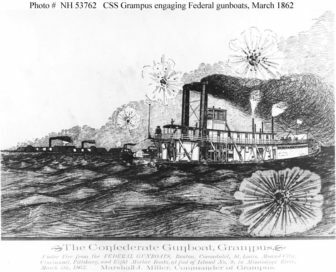 CSS Grampus engaging Federal gunboats, March 1862. CSS Grampus, a 252-ton stern-wheel river steamer, was built in 1856 at McKeesport, Pennsylvania, for civilian employment. Taken over by the Confederate Army in early 1862, she served as a transport and gunboat on the Mississippi River. Grampus was scuttled off Island Number Ten on 7 April 1862 when that fortification surrendered. However, she was apparently raised by Union forces and was probably destroyed by fire on 11 January 1863 under the name Grampus No. 2. Gen. Mackall surrendered 3,000 men, 4,000 stand of arms, 75 siege guns and 24 pieces of light artillery. The enemy captured four transports afloat, and two transports and the gunboat “ Grampus ” which had been scuttled, and a considerable amount of stores and ammunition. The following are the members of Co. K who were surrendered at Tiptonville: Capt. J. F. Whitfield, Lieut. D. S. Hall, Lieut. C. E. Tuttle, Sergts. Thompson, Rodgers, Merritt and Sears, Corps. Williamson and Blaylock, Privates Adams, Bledsoe, C. W. Brown, Cook, Dennis, Farmer, Frank, Fay, Hurd, Killough, May, C. H. Royals, Rice, Roe, D. P. Smith , J. S. Tunnell and Josiah Tunnell ; total, 3 officers and 23 enlisted men. The commissioned officers were sent to Columbus, Ohio, and afterwards transferred to Johnson’s Island; the enlisted men were sent to Camp Butler, near Springfield, Ill. Several of the company were sick, and, with their attendants, were taken prisoners at the camp or in the hospital, viz. : Privates A. P. Brown, E. F. Brown, Fer- gerson, J. C. Hearn, Hearndon, C. J. Moncrief, W. L. Moncrief, J. F. Smith and Tarleton; total, 9. These were sent to Madison, Wis., and afterwards transferred to Camp Douglas, Chicago, Ill. J. F. Smith, mentioned above, started from the Island 10 camp with the company, but was attacked with measles, and was sent back to the hospital. Several hundred of the troops escaped across Reel-Foot River by wading and by boats. Among these were the following members of Co. K: Sergt. Norman Cameron, Corp. J. M. Royals, Privates Averheart, Durden, Hancock, Hutchinson, Elijah Hearn, George Hearn, Holston, Junius Robinson, G. H. Royals and Wilkins; total, 12. Some of these were on detail at Battery 1 and elsewhere, and others were on the sick- list when the company left camp. The companies of the First Alabama stationed at the Island batteries were surrendered by direction of Gen. Mackall to Commodore Porter, Monday night, and were afterwards sent to Camp Butler, Ill.